At the heart of this monastery's history is the story of the medieval hermit Ivan. He was born in the 970's, and chose seclusion because of the moral decline during the reign of the Bulgarian Tsar Peter. He retreated to the almost inaccessible Rila Mountains. There he worked on his ideas, that were aimed at the underprivileged and for equality between people. His cave became a place of veneration for the Bulgarian people. Since the 15th century his relics have been laid to rest in the monastery itself. 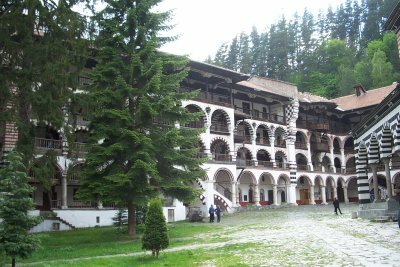 Rila's monastic buildings originally date from the late 10th century, and were set up by the monastic community around Ivan. In the 14th century they were turned into a fortress by Hrelyo Dragovol, a feudal lord. Part of the walls and the tower today still remind of that period. On January 13th 1833, a fire broke out and destroyed almost all (wooden) residential quarters. This national calamity was put right by thousands of Bulgarian craftsmen, that restored the buildings in a couple of years. Here the lamenting stops: because it was worth all the trouble. Rila's is the most momentable, awe-inspiring, colourful and eccentric monastery I have ever been to (and I've seen many). Its location, in the dark green forests and with snow-clad mountains in the backgrounds, couldn't be better. The outside walls are a bit bleak, but entering via the Dupnitsa-gate, my mouth fell open taking in the spectacle. I can't begin to describe the colours, the frescoes, the architecture and all the details, but I hope I can give an impression via the pictures on this site. I love Rila Monastery! 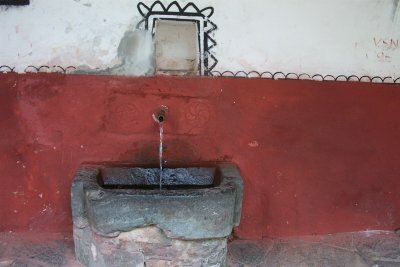 I visited it twice, once last fall and again this spring. The monastery is gorgeous, and has become a symbol of the resillience of the Bulgarian people throughout centuries of opression. The main church is done in Neo-Byzantine style. It was built in the 19th century after a fire destroyed most of the buildings. There is a tower that is from the 13th century. The monastery was begun towards the end of the first millenium AD. I have a longer write up here: UNESCO World Heritage Site: Rila Monastery and an hour-ish interview about Rila Monastery. 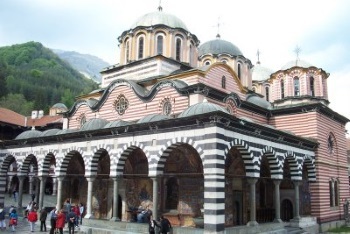 Rila Monastery is a nice day trip from Sofia taking you into the mountains where you will find a colorful monastery. It does feel special and I can’t quite fathom the bad evaluation it got by Unesco. The site spans multiple locations with the monastery in the center. If you want to see the other parts you will have to do some hiking (or bring a car). For your efforts you will be rewarded with nice nature and mountain views. It took me 1:15h to make it to Saint Ivan’s cave. On my way up I wasn’t able to spot the start of the trail and walked along the road. The sign posting leaves much to be desired; it’s also mostly in Bulgarian. From the cave it’s quite straightforward following the trail back, though. But the trails were still rather rough. I assume they will do some maintenance before the hiking season starts in earnest. Given the ubiquity of camping sites and barbecue areas I would guess the area is rather popular in summer. There are daily busses from Sofia departing the western bus station Ovcha Kupel (Tram Line #5) at 10:20h. Tickets are bought on the bus and cost around 6€ one way. Be advised that the bus may be crowded. So if you prefer to have a seat for the next three hours of bus ride, it’s best to queue early. The return by direct bus is already at 15:00h, giving you a less than two hour time window. Enough, if all you want to see is the monastery itself, get a coffee afterwards and get in line early again for your seat. Too little if you actually want to hike to the cave which I would recommend. I returned with the bus at 17:00h to Dupniza. From there half hourly busses run back to Sofia. This connection isn’t even much slower than the direct bus clocking in around 3h. The direct bus makes a lot of stops and does a 15min break in Rila. Not really tourist friendly. If you are travelling onwards to Bansko (Pirin) or Thessaloniki you may want to consider staying in Blagoewgrad. There is a 7:00h and a 12:00h bus to the monastery and it saves you some time as you don’t need to go back and forth to Sofia twice. I skipped on this option as I was eager to get to Sofia and wasn’t sure what to do about my luggage. Some German travellers I met asked around in the monastery and had their luggage stored with the security of the monastery, probably for a tip. For current bus schedules please check the monasteries site. Idea was to go both Rila Monastery AND drive short into Pirin park: that's to much for a day trip from Sofia. So we stuck to the Rila Monastery. Day we visited the kitchen was in renovation and seems to take a bit of months more. The Monastery is really great! We arrived early, around 10AM, there was almost nobody, at 11AM the big groups arrived and we were done making photo's (unfortunately not in the church or museum, also not WITHOUT flash.). My personal opinion is that without flash it's OK to make photos as it does not damage anything. After this, we drove a bit further (around 10 minutes) the road into the mountains, you find a sign of St. Ivan, there you can do a short 30 minute hike up the mountain to the cave he originally lived in, there is a small church devoted to him to. It's not (as far as I know) part of the WHS but for sure worth to visit. I knew from my tour guide that Rila monestery was spectacular, but I really didn't expect what I saw. Such grandeur and sheer beauty is simply shocking. I've been to most European countries and this is by far the most spectacular monestery there is. A must see, if you are comming to europe. I visited Bulgaria this August, and I must say that the Rila monastery was one of the most beautiful things I saw there, though I travelled around the country (Sofia, Varna, Plovdiv etc.) and I saw quite a lot if monuments and sights. I think that the cloister looks fantastic and that it's situated in a gorgeous location, among those fantastic mountains. I really liked those verandahs and balconies, with columns and arches, and the mural paintings were amazing too. I used to live in Bulgarai, until i immigrated to Canada. 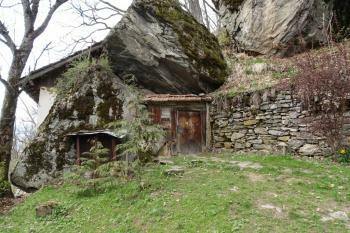 My mother told me that it would be a horrbile waste to have lived in Bulgaria and not to have seen the Rila Monestery. So she got me a ticket and i went to Bulgarai. After a few days of hanging out with my friends i went to the Rila Monestery (with not too much enthusiasm knowing i could be hanging out with my friends). The moment me and my grandparents arrived i was shocked at the beauty and the arcitecture i had seen before my eyes. When i saw the well preserved arcitechture that stood before my eyes i had one more reason to be proud of being Bulgarian. 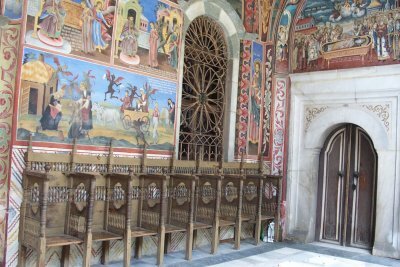 The Monestery is located in the Rila mountain, where it was made to preserve Bulgarian culture from the invasion of Turkie. For anybody who has the time, belive it is something worth seein in your life time. Monastery of Rila it's the first reason why i gone in Bulgaria the first time. i really love it and be happy to see it eache time i can. it's a beautiful monastery "lost" in the Mount Rila, in the south west of Bulgaria. It was founded in the X century by the monk-hermit St John of Rila and it played an important role in the intellectual and political life of Bulgaria during the Middle Ages After the etablishment of the ottoman rule the cloister quickly falls into decay, but in the XV century it is again restored and inhabited and becomes a stronghold of the Bulgarian national spirit and culture. 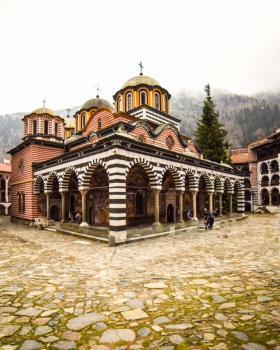 In the epoch of the Bulgarian national revival the Rila cloister is enlarged an renovated withe the help of the whle nation and participation of the most priminent Bulgarian craftsmen -builders and painters. In its present appearance it is the most impresive monument of the Bulgarian revival- a unique architectural ensemble, in wich are preseved artistic welths an rich museum collections. OUV provided by Reconstructions: Inscribed despite ICOMOS view that " ICOMJS is of the opinion that Rila monastery, nearly entirely reconstructed during the contemporary period, does not answer the criterion of authenticity" (AB). 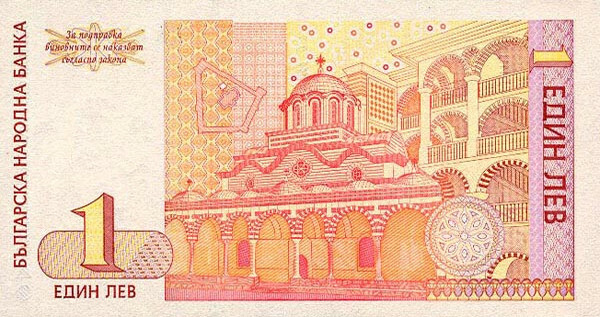 This was "overcome" by assigning OUV as follows "Rila Monastery is considered a symbol of the 19th Century Bulgarian Renaissance which imparted Slavic values upon Rila in trying to reestablish an uninterrupted historic continuity."